So, the Secretary of State says that a country in the Middle East has weapons of mass destruction. Sound familiar? It should. It's happened before. Remember how much the left criticized the claim a decade ago? But not so much this time. What's the difference? The difference? Well, it's certainly not that one's true and one's not. 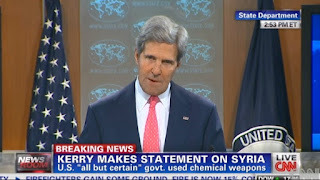 I don't doubt that Syria has and has used WMDs. And, the fact is, there were WMDs in Iraq, though some of the sources weren't completely reliable. But, about the Democrats believing one but not the other? Since both are Obama supporters, it's not politics. So, what could it be? Maybe that one's Black and one's White? Why is the Democrats believing the White guy, but didn't believe the Black guy? What do the Democrats have against Blacks? Looks like the party that founded the KKK has a hard time letting go of old habits. 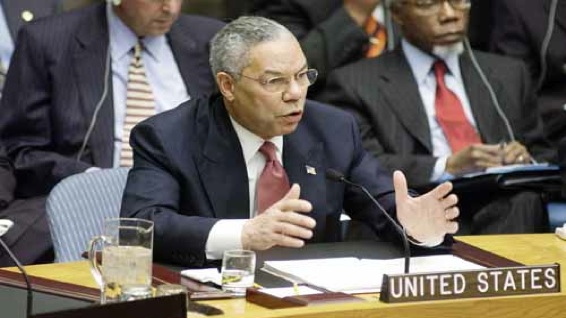 Also, at the time, Powell was sort of a Republican working for Bush. And Democrats don't believe what Republicans say. Hell, I don't believe what Republicans say any more, either. @ #1 Thats just crazy talk!